- Its dry! Great for keeping trouser legs grease free, road bikes, triathlon and Bromptons! Some people don't like using chain oil because it makes their trouser leg dirty on the way to work. Well, Green Oil Dry Chain Wax is the solution. Simply, put it on your chain, let it dry, and it leaves a semi-dry lubricating film on the chain. Dry lubes tend not to last as long as wet lubes, and offer less protection in the wet. With Green Oil Dry Chain Wax, we're continuously improving the formulation to increase longevity and performance, with fewer applications between rides. Why use Green Oil Dry Chain Wax? Its important to keep your chain lubricated. Lubing your chain reduces friction, meaning you go faster and have a smoother gear changes. A lubricated chain results in fewer chain replacements too. Green Oil Dry Chain Wax is great for dusty trail riding. We do occasionally have dry weather in the UK, which Dry Chain Wax is designed for. In these conditions, you get more airborne dust which can stick to the chain. Green Oil Dry Chain Wax is dry, so minimal dust is attracted. Its great for city riding too. Green Oil Dry Chain Wax won't go on your trouser leg like other lubes, so its great for the commute to work on your fixie in Old Street, or your Brompton on the way to West Brompton. 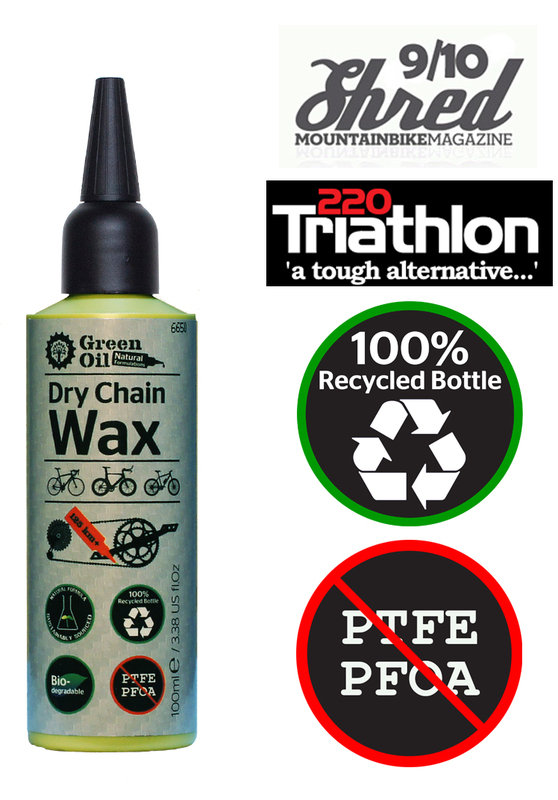 We also recommend Green Oil Dry Chain Wax for road racing, BMX riding and recumbent bikes. Green Oil Dry Chain Wax is great for Bromptons and other folding bikes - where you're more likely to get oily whilst folding it up. Green Oil Dry Chain Wax means not getting chain oil on your clothing. 2. With the cap on, shake the bottle vigorously upside down. - Slowly turn the cranks backwards, watching a single chain link. 4. Squeeze the bottle gently to apply Green Oil Dry Chain wax to the top part of the bottom half of the chain (see picture below). 5. Turn the cranks back for one chain circulation, and leave to dry for 7 minutes. (This is especially important if its raining). 6. You are ready to ride. Alternatively, for a super clean chain, wipe off excess by running the chain once through a rag. How is Green Oil Dry Chain Wax eco friendly? Other dry lubes out there contain PTFE and petrochemicals, some even using toxic paraffin as a solvent. They often use petrochemical wax too. 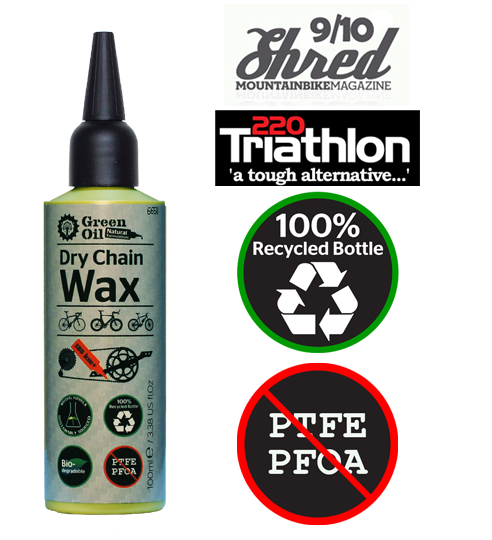 Green Oil Dry Chain Wax uses bees wax within the formula, and after its life on your bike, is totally biodegradable. Part of the formula is bioethanol made from sugar. This is grown in the EU, and is the solvent part of the formula. - PTFE accumulates in the food chain, after leaving your bike chain. - PTFE is a polyflourinated chemical. Petrochemicals often harm the environment and aquatic life. Green Oil Dry Chain Wax however is petrochemical and PTFE free, contains no paraffin and is totally biodegradable. Every Dry Chain Wax bottle is made from 100% recycled plastic - so don't be surprised if the bottle is a curious colour! Green Oil UK Limited will pay you 10p in cash for your old Green Oil Dry Chain Wax bottle. Selected retailers will refill your bottle for a 10p or 20p discount. See us at the next trade show for your bottle deposit! You can of course though recycle the bottle. The cap is made of polypropylene - plastic type 5, and we're honest about it - most councils in the UK don't take plastic type five for recycling. - Review by Peter Eland, Velovision December 2010, page 33. - Review by EveryDayCyclist. Click logo for the full review. - Review by Chasing Trails. Click for full review. - Review by Richard Hallet, Road Cycling UK. Click on the RoadCyclingUK.com logo to see the online review. ...Eco credentials bagged... handy water pistol setting...the bike was effectively cleaned. Hassle your local bike shop. - Review by Shred Magazine Issue 58. - Review in Cycling Weekly, 13th December 2007, page 44. - Click on the MTBR.com logo for the full review. - Click on the Bikegoo.co.uk logo for the full review. - Review In 220 Triathlon Test Center, February 2008, page 102. Downs - Nothing much - recycled label gets tatty quickly, but who cares? - Review by Mike Davis for BikeMagic.com. Ratings shown are out of 5 (yes top marks!) Click on the BikeMagic.com logo for the full review. -No joke, this smells like an insalata caprese! Product images from this site may be used for use in selling our products.